Formal haben die beiden Ankündigungen des US-Außenministers nichts miteinander zu tun – inhaltlich aber um so mehr, und dass er beides am selben Tag am gleichen Ort sagte, dürfte auch gezielt so inszeniert worden sein. Der von US-Präsident Donald Trump seit seinem Wahlkampf verwendete Slogan America First wird damit in tatsächliche US-Außenpolitik umgesetzt. Der Ausstieg aus dem zwischen den USA und Russland 1987 abgeschlossenen INF-Vertrag (Intermediate Range Nuclear Forces Treaty) hatte sich bereits seit Wochen abgezeichnet. Die USA, aber inzwischen auch die NATO, werfen Russland vor, bereits seit geraumer Zeit gegen diesen Vertrag zu verstoßen, der Entwicklung, Erprobung und Stationierung von landbasierten Flugkörpern mit Atomsprengköpfen und einer Reichweite von 500 bis 5.500 Kilometer verbietet. Insbesondere in der Kritik ist das russische 9M729-System, von der NATO als SS-C-8 bezeichnet. Am Dienstagnachmittag, noch vor Pompeos Ankündigung, hatten die NATO-Außenminister erstmals in einer gemeinsamen Erklärung Russland konkret die Verletzung des INF-Vertrags vorgeworfen und Moskau aufgerufen, zu einer nachprüfbaren Einhaltung der Vereinbarung zurückzukehren. But whatever successes this treaty helped produce, today we must confront Russian cheating on its arms control obligations. As I told my fellow ministers earlier today, our nations have a choice. We either bury our head in the sand or we take common-sense action in response to Russia’s flagrant disregard for the express terms of the INF Treaty. It’s worth noting that Russia’s violations didn’t happen overnight. Russia’s been flight-testing the SSC-8 cruise missile since the mid-2000s. They’ve been testing it in excess of ranges that the treaty permits. All the tests of the SSC-8 have originated from a Kapustin Yar site from both a fixed and mobile launcher. Its range makes it a direct menace to Europe. In 2017, General Selva of the Joint Chiefs of Staff told Congress that Russia had deployed its missile, and I quote, “in order to pose a threat to NATO and to facilities within the NATO area of responsibility,” end of quote. Russia continues to press forward, and as of late 2018 has filled multiple battalions of the SSC-8 missiles. Throughout all of this, the United States has remained in scrupulous compliance with the treaty. In spite of Russia’s violations, we have exercised the utmost patience and effort in working to convince Russia to adhere to its terms. On at least 30 occasions since 2013, extending to the highest levels of leadership, we have raised Russia’s noncompliance and stressed that a failure to return to compliance would have consequences. Russia’s reply has been consistent: deny any wrongdoing, demand more information, and issue baseless counter-accusations. For more than four years, Moscow has pretended that it didn’t know what missile or test the United States was even talking about, even when we provided extensive information about the missile’s characteristics and testing history. It was not until we chose to publicize the Russian name of the missile in November of 2017 that Russia finally acknowledged its existence. Then Russia changed its cover story from the missile that does not exist to the missile that exists but is treaty-compliant. These violations of the INF Treaty cannot be viewed in isolation from the larger pattern of Russian lawlessness on the world stage. The list of Russia’s infamous acts is long: Georgia, Ukraine, Syria, election meddling, Skripal, and now the Kerch Strait, to name just a few. In light of these facts, the United States today declares it has found Russia in material breach of the treaty and will suspend our obligations as a remedy effective in 60 days unless Russia returns to full and verifiable compliance. We’re taking these steps for several reasons. First, Russia’s actions gravely undermine American national security and that of our allies and partners. It makes no sense for the United States to remain in a treaty that constrains our ability to respond to Russia’s violations. Russia has reversed the trajectory of diminishing nuclear risk in Europe, where America has tens of thousands of troops and where millions more American civilians are living and working. These Americans live and work alongside many more millions of Europeans who are put in danger by Russian missile systems. Second, while Russia is responsible for the demise of the treaty, many other states – including China, North Korea, and Iran – are not parties to the INF Treaty. This leaves them free to build all the intermediate range missiles that they would like. There is no reason the United States should continue to cede this crucial military advantage to revisionist powers like China, in particular when these weapons are being used to threaten and coerce the United States and its allies in Asia. If you ask the question why the treaty wasn’t enlarged to include more nations, including China, keep in mind that it has been tried three times without any success already, and it has failed each time. Third, inertia will not drive policy in the Trump administration. As President Trump has made clear and as I spoke about this morning, the United States will not support international agreements that undermine our security, our interests, or our values. Finally, and I want to be clear about this, America is upholding the rule of law. When we set forth our commitments, we agree to be bound by them. We expect the same of our treaty counterparts everywhere, and we will hold them accountable when their words prove untrustworthy. If we do not, we’ll get cheated by other nations, expose Americans to greater risk, and squander our credibility. Earlier today, I spoke on America’s enduring leadership role in the international order and I reiterate that powerful American leadership means never abandoning our responsibility to protect our security and our nation’s sovereignty. I’ve stated our position in no uncertain terms. The United States remains hopeful that our relationship with Russia can get better, can get on better footing. With that being said, the burden falls on Russia to make the necessary changes. Only they can save this treaty. If Russia admits its violations and fully and verifiably comes back into compliance we will, of course, welcome that course of action. But Russia and Russia only can take this step. We appreciate NATO’s strong support for the United States decision as expressed in this statement released today. The United States and our NATO allies stand vigilant that Russia’s lawless conduct will not be tolerated in the realm of arms control or anywhere else. Ob und wie diese Absicht zuvor unter den NATO-Außenministern debattiert wurde, ist noch unklar. Auch vorerst die Folgen, falls der vom US-Außenminister genannte Zeitraum ergebnislos verstreicht. Pompeos andere Rede vor dem German Marshal Fund of the United States in Brüssel hatte eine etwas andere Zielrichtung – und enthielt zwar keine Einzelschritte, aber eine generelle Positionierung, die schon die Überschrift Restoring the Role of the Nation-State in the Liberal International Order klar machte. After the Cold War ended, we allowed this liberal order to begin to corrode. It failed us in some places, and sometimes it failed you and the rest of the world. Multilateralism has too often become viewed as an end unto itself. The more treaties we sign, the safer we supposedly are. The more bureaucrats we have, the better the job gets done. Every nation – every nation – must honestly acknowledge its responsibilities to its citizens and ask if the current international order serves the good of its people as well as it could. And if not, we must ask how we can right it. This is what President Trump is doing. He is returning the United States to its traditional, central leadership role in the world. He sees the world as it is, not as we wish it to be. He knows that nothing can replace the nation-state as the guarantor of democratic freedoms and national interests. He knows, as George H.W. Bush knew, that a safer world has consistently demanded American courage on the world stage. And when we – and when we all of us ignore our responsibilities to the institutions we’ve formed, others will abuse them. Critics in places like Iran and China – who really are undermining the international order – are saying the Trump administration is the reason this system is breaking down. They claim America is acting unilaterally instead of multilaterally, as if every kind of multilateral action is by definition desirable. Even our European friends sometimes say we’re not acting in the world’s interest. This is just plain wrong. The first two years of the Trump administration demonstrate that President Trump is not undermining these institutions, nor is he abandoning American leadership. Quite the opposite. In the finest traditions of our great democracy, we are rallying the noble nations of the world to build a new liberal order that prevents war and achieves greater prosperity for all. We’re supporting institutions that we believe can be improved; institutions that work in American interests – and yours – in service of our shared values. Die gesamte Rede enthält dazu weitere Details, bis hin zur Verdammung der Vereinten Nationen oder konkret des Internationalen Strafgerichtshofs als rogue international court, internationalen Schurkengerichtshof. Die einzige supranationale Institution, die halbwegs gut wegkommt, ist die NATO – unter US-Führung. Unterm Strich: Die USA nahmen unter Trump schon vorher das Recht in Anspruch, international zu sagen, wo es lang gehen soll. Pompeo hat nur Schritte zur Umsetzung angekündigt. Das ist nicht nur ein Paradigmenwechsel, sondern geht weit darüber hinaus und riecht nach Zeitenwende, unter U.S. Führung, das Ende der bekannten Nachkriegs- und Nachwendeordnung. Das Angebot „Russland 60 Tage Zeit habe, zu einer full and verifyable compliance mit dem INF-Vertrag zurückzukehren“ bietet Chancen zu mehr und multinational umfassenderer Kontrolle. Ein neu verhandelter INF 2.0 muss unbedingt Staaten einschließen, die INF bereits besitzen oder dies anstreben: IRN, CHN, ISR, IND, PAK, KSA. NATO-Europa, will im wesentlichen heißen die EU, muss sich einen gewichtigen Platz bei Neuverhandlungen sichern, mit eigener Stimme. Und zwar als „Erst-Gefährdete“ bei Einsatz der Waffen. Tatsache dürfte jedoch vielmehr sein, dass sowohl Russland als auch die USA gar nicht unglücklich darüber sind, irgendwie aus dem INF-Vertrag herauszukommen. Und mit einem Minimum an geostrategischem Verstand weiss man auch warum: Die antwort heißt China. Während nämlich Moskau und Washington formal die Hände in der Mittelstrecke gefesselt sind, rüstet Peking unverdrossen und fröhlich vor sich hin. Es mag den Europäern ja nicht recht eingehen … aber in diesem Szenario spielen sie – ganz entgegen zur NATO-Nachrüstungsdebatte in den 1980ern – gar keine Rolle. Und aus diesem Grunde steht auch ein neuerlicher europäischer Atom-Rüstungswettlauf gar nicht zu befürchten … denn daran haben weder Russland noch die USA Interesse. Nur braucht das Kind natürlich einen Namen. Und ein bilateral bindender Vertrag kann ja nun schwerlich aufgrund des Verhaltens eines Dritten gekündigt werden … also beschuldigen die USA Russland und Russland die USA. Trump wirft die Weltordnung weg wie einen nassen Lappen und die deutsche Politik schweigt dazu? Von Merkel und Aussenminister hätte ich mehr erwartet. Vor allem Widerstand in der NATO zu organisieren, anstatt den wagen Verdacht der russischen Vertragsverletzung auch noch zu unterstützen. Es ist eine endgültige Kündigung des Vertrages, denn Russland kann jetzt zum Vertrag nicht mehr zurückkehren ohne sein Gesicht zu verlieren. Die Gefahr des Atomkrieges wird jetzt nach Europa zurück kehren, denn den Vertrag zu kündigen, ohne neue Atomwaffen mittelfristig in Europa zu stationieren ergibt keinen Sinn. die USA handeln doch konsequent, Russland ist notorischer Vertragsbrecher und die USA erkennen dieses Faktum schlicht an. Der erste Schritt jeder echten Lösung ist nüchtern die Fakten anzuerkennen und nicht in hilfloser Paralyse die Realität zu Leugnen um nicht handeln zu müssen (Strategie der Europäer bisher). wenn russland eine nachrüstung europas braucht um seinerseits wieder abzurüsten: bitte schön, können wir uns eher leisten als Russland. Der war nie tot und nur in europa hat man sich in seiner provinziellen end of history mentalität etwas anderes eingeredet. Nationalstaaten sind das Fundament der globalen Ordnung un die relevanz internationaler Institutionen leitet sich vom Willen der Staaten ab diese zu stützen. Die gegenwärtige Struktur war ja ein Produkt amerikanischer Grand Strategy, jetzt wendet sich der schöpfer eben von seiner Schöpfung ab. Das die USA einen globalen Führungsanspruch mit mal mehr mal weniger offenem Hegemonialhabitus an den Tag legen dürfte auch niemanden überraschen. Machen uns all die Verträge wirklich sicherer? Was bringen jahrzehntelange Friedensmissionen der UN? Schützt die EU wirklich die Interessen der Völker vor denen der „Bürokraten hier in Brüssel“? Sehen die USA (richtigerweise?) die Tatsachen, eine Welt wie sie ist, nicht wie Europäer sie sich erträumen? Moskau wird sich keinem 60-Tage-Diktat beugen, da muss Diplomaterisches kommen. Es sei denn, die Frist ist lediglich vorgeschoben und das U.S.-Aus längst entschieden. Europa muss achtgeben, der Weg vom strategischen Subjekt zum Objekt kann mit Trump rasch durchschritten werden. Die Begründung der Stationierung von AEGIS Ashore in POL / ROM war die Abwehr von IRN Flugkörpern. Die globale Ordnung ist nichts, was man „kündigen“ kann, sondern etwas, das aufgrund von Kräfteverhältnissen entsteht. Pompeo hat faktisch gegenüber den Herausforderern der USA erklärt, dass die USA sich für stärker halten als sie allgemein wahrgenommen werden. Ob dieses Vorhaben der derzeitigen amerikanischen Regierung erfolgreich ist, hängt nun davon ab, wie glaubwürdig sie ihre Macht demonstrieren. Am besten funktioniert das im Rahmen einer militärischen Konfrontation. Bei solchen haben sich die USA allerdings seit 1991 nicht mehr durchsetzen können, weshalb den Amerikanern hier große Aufgaben bevorstehen, falls sie es ernst meinen sollten. Da man im Irak und in Afghanistan gescheitert ist und in Syrien die Russen deutlich effektiver waren, müsste man sich zur Zwecken der Machtdemonstration einen anderen Schauplatz suchen, z.B. das Baltikum oder das Südchinesische Meer. Solche Konfrontationen haben zudem aus amerikanischer Sicht den Vorteil, eine gespaltene Bevölkerung hinter ihrer Regierung zu vereinen. Der SP der USA wird im pazifischem Raum liegen. Für Europa werden nur geringe Kräfte vorgehalten werden, m.A.n. Die Hauptbedrohung ist CHN, sowohl wirtschaftlich, als auch räumlich-expansiv (ausgreifend bis auf die Philippinen). D.h. wir müssen deutlich mehr für unsere Verteidigung tun, auf die USA können wir uns in Europa nicht mehr abstützen. In wie weit Europa dabei involviert ist ( https://www.iss.europa.eu/content/guns-engines-and-turbines-%E2%80%93-eu%E2%80%99s-hard-power-asia ) – tbd. Herr Albrecht ! guter Kommentar…. wie wäre es mit dem Iran als Muskelspiel ? In zwei Jahren russischer militärischer Intervention hat das Bündnis Assad-Putin es geschafft vier der größten Städte weitgehenst in Schutt und Asche zu schiessen und 6% des Landes zurückzuerobern. Die Gegner waren dabei immer die gerade schächsten Rebellen. Vom islamischen Staat lies das Bündnis Assad-Putin bis zum Schluß die Finger, es kam nie zu nennenswerten Kampfhandlungen zwischen Assad-Putin und IS. In zwei Jahren westlicher militärischer Intervention konnte das Bündnis SDF+Westen 35% des Lands einzunehmen. Dabei kam es nur in Kobane (Stichwort „End of the Beginning of the IS“) und in Raqqa (Stichwort „Beginning of the End of the IS“) zu grösseren Zerstörungen wobei der IS weit entschlossener und besser ausgerüstet war. Die einzigen nennenswerten Grundgewinne des Bündnis Assad-Putin findet man in Regionen in denen der IS vor dem Bündnis SDF+Westen zurückgewichen ist und in die das Bündnis SDF+Westen aus taktischen Gründen nicht eingerückt ist (Stichwort Race for the Euphrates). Noch ein Vergleich: Die türkische Armee hat in drei Wochen in der Operation „Zeytin Dalı“ mehr Territorium in Syrien eingenommen als das Bündnis Assad-Putin in drei Jahren. Daß die Russen in Syrien enorm erfolgreich sind ist ein Sputnik-Mythos. Die Welt ist eine Kugel und wenn RUS zu China steht, dann müssen die UYA auch ihre Gegenüberküste sichern. So ist es, nur hat Westeuropa einen Plan? Über 1,5 Mio Soldaten unter Waffen kaum Mun, kaum Abstimmung, keine integrierte Luftverteidigung, kaum Flugabwehr, kaum IDS Fähigkeit uvm. Wir müssen in erster Linie anders investierten Westeuropa (EU÷Partner) benötigt abgestimmte und glaubhafte Abschreckung mit der Fähigkeit zur Verteidigung (in dieser auch Angriffsfähigkeit/Zweitschlag). Die USA entwickeln sich (noch mehr) zu einer Bedrohung unserer Interessen. Es liegt mir fern, Partei für einen anderen Staat als Deutschland zu ergreifen, aber wäre für die Bewertung der militärische Entwicklungen die Frage der strategischen Bedeutung des kontrollierten Geländes nicht relevanter als nur dessen Fläche? Die Städte, auf die sich die syrische Regierung mit russischer Unterstützung konzentriert hat, erscheinen mir diesbezüglich im Vergleich zur dünn besiedelten Fläche des Landes relevanter zu sein. Unabhängig davon hört man allerdings auch von anderer Seite, dass der Russe seine militärische Leistungsfähigkeit stark übertreibt, was an innen- und außenpolitischen propagandistischen Absichten als auch an Falschmeldungen innerhalb der Streitkräfte liege. Die Absicht meines Kommentars war allerdings sarkastischer Art. Ich wollte vor allem darauf hinweisen, dass die USA überzeugendere Machtdemonstrationen brauchen werden, wenn sie glaubwürdig den Anspruch erheben wollen, unilateral die globale Ordnung bestimmen zu können. Danke@Wait&C für die gute Darstellung: M.E. war auch das hauptsächliche Ziel des RUS-Engagements in Syrien eher darin zu sehen, den Sturz Assads, durch wen auch immer, zu verhindern, dabei aber zugleich sicherzustellen dass der Westen weiterhin wesentliche politische Energien auf die humanitäre Situation verwenden muss. Militärisch mögen die Erfolge bescheiden sein. Politisch hat Putin aus dem Syrienkonflikt ziemlich Kapital schlagen können. Um mich zu wiederholen, die sonstigen, bisher von Vertragswerken nicht erfassten Nutzer, dürfen nicht vergessen werden. Hier, der Iran, im Rahmen der Short-Range Nuclear Forces (SNF) aber auch bei INF! Aus europäischer Betrachtung, stehen IRN Systeme zwei Straßen weiter, für ISR im Nachbarhaus. Es hat sich eine Fähigkeitslage entwickelt, die DEU/EUR nicht gleichgültig lassen kann. RUS und CHN – in der Tat eine interessante Verbindung. Aber ob diese auch mittelfristig tragfähig ist (auf lange Sicht sind wir ja eh alle tot (Keynes))? Sehe ich ähnlich, das war auch nicht die Absicht. Vielmehr hatte ich beim ersten Eintrag den IRN, neben weiteren Nutzern, nur aufgezählt. Mit der Beschreibung des Atlantic Council wird eine IRN Befähigung allerdings unterstrichen. Edit: Ist ein Grund für einen Kommentar erforderlich, der den persönlichen Diskussionswunsch hinten an stellt? Im aktuellen INF-Disput zwischen den USA und RUS kann die Fähigkeitslage anderer als „(Sub)Thema“ aufgefasst werden? Ja, durchaus, mit Blick auch z.B. CHN und IND. Im Fall Iran bin ich allerdings anderer Auffassung, weniger aus befürchteter nationaler Bedrohung, als vielmehr aufgrund deutscher gesamtstaatlicher Verantwortung für Israel. Und, um iranische Absichten abzurunden, neben Israel erfreut sich die sunnitische Zentralmacht Saudi-Arabien besonderer mil Aufmerksamkeit der Mullahs. M.E. liegt eine Verhinderung von INF- Bedrohungen im Mittleren Osten in deutschem Interesse. 1. Die USA schafft sich eine – bislang nicht existierende- nukleare Option, die einen Nuklearkrieg führbar macht ohne das amerikanische Territorium mit einem Gegenangriff zu bedrohen. Insofern ist die Aufgabe des INF-Vertrages tatsächlich im US-amerikanischen Interesse. Und wenn man das europäische Interesse ausblendet, handeln die USA konsequent. 2. Europa liegt – wie vor 1987 – nun wieder unter einer ständigen nuklearen Bedrohung die von Mittelstreckenwaffen ausgeht. Auf Grund der geringen Flugzeit dieser Waffen und der dadurch nicht vorhandenen Möglichkeit einen Fehlalarm als solchen identifizieren zu können, hängt Europas Sicherheit an einem „seidenen Faden“. Taktische Zwischenfälle wie der in Straße von Kerch können tatsächlich zu einem nuklearen Schlagabtausch führen. Das erinnert fatal an den 1. Weltkrieg. Damals war es die Mobilmachung, die einmal von einem der Gegner ausgelöst, den anderen dazu zwang ebenfalls sofort mobil machen zu müssen, um den Krieg überhaupt noch gewinnen zu können. 3. Der ameriknaische Außenminister hat Russland 60 Tage Zeit gegeben zu reagieren. Er hat aber vier Gründe genannt, die zum Ausstieg der USA aus dem Vertrag führten. Unter anderem die Nichtteilnahme von China und anderen Staaten. Demzufolge kann Russland machen was es will, die USA würden immer noch aussteigen. Mit anderen Worten, die USA wollen die einzige Weltmacht bleiben. Das ist der eigentliche Grund des Ausstiegs aus dem INF-Vertrag. Ein schlechter Tag für die europäische Sicherheit. Auch wenn Sie Leon Panetta in Ihre Argumentation miteinbeziehen- ich denke Sie liegen nicht nur in Ihren Schlussfolgerungen falsch. – RUS stand 2011-13 kurz davor, in SYR seine mil Praesenz zu verlieren. Turnaround ist seit 2014/15 vollstaendig gelungen. Pol waren die RUS sowieso immer die entscheidende Macht in SYR. – Zeitgleich verloren die USA nahezu ihren gesamten Einfluss. ( Rote Linien, die folgenlos ueberschritten wurden, Verlust der UN- Beobachtermission UNSMIS, Abzug nahezu aller westl. diplomatischen Vertetungen etc.) Der IRN stiess erfolgreich in diese Luecke. – Gelaendegewinne in einem Land, dass nur ueber wenige strategische Infrastruktureinrichtungen verfuegt, umso mehr aber ueber Staub, Dreck und zunehmende Verwuestungen verfuegt, sind von nachrangiger Bedeutung. Kontrolle ueber die Bevoelkerung und ihrer Zentren, uber die wenigen, aber umso wichtigeren Kommunikationslinien und -zentren, das Eindaemmen radikal-islamischer Einfluesse, die Verhinderung einer wie auch immer gearteten westlichen Intervention, das Einsetzen von politischen Loesungen, an denen bislang die UN und alle anderen „dauerbesorgten“ Moechtegernteilhaber gescheitert sind – das sind alles politische und mil. Erfolge, an den RUS z.T. entscheidenen Einfluss hatte. – Den IS einem USA- gefuehrten Buendnis zu ueberlassen, ist einerseits der US- Verpflichtungen ggue. dem IRK ggue zu erklaeren, andererseits haben RUS und Assad die eigentliche Drecksarbeit verrichtet, in dem sie durchaus faehige terrororganisationen wie Jabhat al Nusra ( AQ- affin) die ganzen al Sham- Gruppierungen, radikalisierte Palaestinenser und auch teile des IS in SYR erfolgreich bekaempft haben. Damit haben sie nicht nur das regime assad konsolidiert, sondern die strategische Lage im gesamten Nahen Osten stabilisiert. Fuer’s erste jedenfalls. In der Summe war RUS in SYR mindestens genauso erfolgreich wie der Westen in der Bekaempfung des IS durch OIR. Vielleicht ist es an der Zeit, endlich komplementaer zu denken und nicht nur kontrovers. Aber das ist OT. – Derzeit schwindet der US- Einfluss auf Europa und im Nahen Osten. Das ist auch selbstverschuldet, aber nicht nur. Die Paradigmenwechsel in der Rohstoffversorgung, in der Priorisierung des pazifischen Raumes und der damit einhergehenden Anerkennung CHN als Rivalen und Konkurrenten ( durch Obama), das Disengagement nach AFG und IRK und nun das teilweise ungeschickt vorgetragene „America First“- Stratagem hinterlassen Spuren. Das erkennen die Amerikaner nun und formulieren etwas, was noch vor 10 Jahren eigentlich selbstverstaendlich und im Westen als unumstritten galt: US- Praesenz und Fuehrung. – Tatsaechlich beisst sich „America First“mit dem von AM Pompeo umrissenen Fuehrungsanspruch. Es sind genau diese damit einhergehenden Kosten und Preisschilder, die Trump seinem Wahlvolk versprochen hatte, zu senken und die in Europa, in der NATO zu einem Sinneswandel beigetragen haben. Im Grunde genommen, zeichnet sich hier ein Bruch des Trump’schen Wahlversprechen ab, nicht ueberall verpflichtet sein zu wollen. – Die Kuendigung des INF- Vertrages muss nicht bedeuten, dass hier mit alten Methoden versucht wird, RUS zum Einlenken zu zwingen. Die Taktik des Einreissens, um anschliessend zu anderen Bedingungen neu aufzubauen, ist neue US- Verhandlungsmethode, durchaus mit Erfolgen. Sollten die eigentlichen Addressaten Staaten wie IND, PAK, PRK, IRN und v.a. CHN sein, die in einem neuen Vertrag einzubinden auch im Interesse RUS‘ laege, dann macht die gegenwaertige Entwicklung sogar Sinn. Fragwuerdig bleibt aber allemal, ob es keine alternativen Mitel und Wege zur Erreichung gaebe. Moskau lehnt 60-Tage-Drohung ab. „Die USA manipulieren die Fakten“. Nun ist es an Europa seine Interessen zu vertreten. Definiert sind sie in unzähligen Papieren. Sollte das wirklich so kommen, sehr schlecht. Ich kann mich noch erinnern, das zu meiner aktiven Zeit massiv in der BRD Marschflugkörper (der Grund für den INF-Vertrag) stationiert wurden, welche die Vorwarnzeit extrem verkürzten. Vorher war man von einem Zeitraum von dreißig Minuten ausgegangen (davon gingen alle Alarmübungen aus, eventuell wäre eine Kommunikation sogar noch möglich gewesen, hoffte man) und davon, das der massive Einsatz von strategischen Kernwaffen von jedem bei Verstand abgelehnt wird. Das allseits bekannte Gleichgewicht des Schreckens also. Die schlecht ortbaren Flugkörper hatten das komplett über den Haufen geworfen. Da sich nach kurzer Zeit herausstellte, das die Russen keine nennenswerten Probleme hatten etwas vergleichbares auf die Beine zu stellen, wurde der Vertrag ratifiziert. Praktisch war das ein bisschen Augenwischerei, da fast genau die selben Raketen auf Schiffen stationiert werden durften (sehe deshalb das Problem mit China nicht so, die USA hat jede Menge Marschflugkörper mit hoher Reichweite). Aber man zeigte das man nicht auf Teufel komm raus eskalieren wollte. Es gab ja noch die Planungen wenn es schon zu einem heißen Krieg kommen sollte diesen auf Mitteleuropa zu beschränken und nur hier Kernwaffen einzusetzen. Gegen Kernwaffen mit geringer Reichweite hatten die Großmächte bekanntlich nichts. Hätte vermutlich nicht funktioniert, da alle eine Scheiss Angst hatten. Der alte Spruch wer zuerst schießt lebt länger ist in einem solchen Scenario nicht hilfreich. Wir wären so oder so alle tot gewesen. Jetzt scheinen viele die Bedrohung die von diesen Waffensystemen ausgehen nicht zu erkennen oder zu unterschätzen. Da die Russen jetzt die Nato direkt vor der Haustür (mit Raketenabwehrsystem, ob das wirklich funktioniert ist da erstmal nebensächlich) haben, werden die noch nervöser sein. Was die Gefahr einer Eskalation erheblich steigert. Vieles was die in letzter Zeit getan haben erweckt den Eindruck angstgesteuert zu sein (weil es wirtschaftlich und politisch sonst keinen Sinn ergibt) um einer Einkreisung zuvorzukommen und überall rote Linien aufzuzeigen die sagen, bis hierher und nicht weiter. …muss Kontinentaleuropa endlich erwachsen werden, sonst werden wir wieder zum Spielball (Schlachtfeld) der Großmächte, die sich selbst mit den ballistischen Langstreckenraketen ausbalancieren während Kontinentaleuropa keine Vorwarnzeit mehr hat, um zu entscheiden, ob ein Angriff mit Mittelstreckenraketen stattfindet oder es nur eine Fehlwarnung ist. Es ist Europa „gelungen“, wieder unter der exakt selben tag-täglichen Nuklearbedrohung zu stehen unter der wir bis 1987 gestanden haben. Erschütternd! Ein absolutes beschämendes Ergebnis von europäischer Außen- und Sicherheitspolitik. Dies ist nun wirklich die Zeit für ernsthafte Sicherheitspolitiker, die um Entspannung bemüht sind, und nicht für die Talk-Show- Sesselstrategen, die sich in den allgegenwärtigen Talk-Shows selbstgefällig inszenieren ohne die Dimension dessen, was sie debattieren, auch nur andeutungsweise zu realisieren. Was macht mir Hoffnung? Dass z.B. Sigmar Gabriel den Mut hat, andere Töne als noch vor einem Jahr deutlich aus zu sprechen. Wenn jetzt auch einige Medien den Mut hätten kritische Stimmen wenigstens anzuhören, dann könnten wir noch einmal die Kurve kriegen. Ansonsten sehe ich schwarz für unseren Kontinent weil wir dann in den nächsten großen Krieg erneut „schlafwandeln“. Glauben Sie wirklich an diese „Gut- Böse“-Show, die Sie hier präsentieren? Was ist mit der Kündigung des ABM-Vertrags durch diie USA? Was ist mit der Kündigung des Iran-Nuklearabkommens durch die USA; obwohl dieses Abkommen durch die UNO moderiert wurde und Iran keine Vertragsverletzungen begangen hat? Ich glaube, dass Sie sich recht einseitig informieren. Leider! Die Tragfähigkeit der Beziehung RUS und CHN ist ggf so stark wie die der USA und Sowjetunion im Krieg, danach ist’s wurscht. Wollte man das Problem wirklich lösen, ob beide Vertragsparteien vertragstreu sind, gäbe es eine einfache Lösung. Bis 2001 fanden die gegenseitigen Verifizierung statt. Und es war ein Fehler diese seitlich zu begrenzen. Durch die Wiedereinführung von Verifizierungen könnten die Russen die Raketenabwehr in Osteuropa und die Nato die russischen Iskander-Raketen kontrollieren und verifizieren. Denn wenn die USA den Vertrag kündigen, ist Europa der große Verlierer. Der Kalte Krieg und die Gefahr des Atomkrieges aus Versehen, wird wieder aktuell werden. Ob neue Mittelstreckenraketen der Nato oder nur neue Raketenabwehr in Europa mittelfristig stationiert wird ist egal, weil beides von Rußland als Bedrohung angesehen werden wird. Die Mutter aller Probleme ist eben nicht die Flüchtlingsfrage, sondern Kalter Krieg und neues atomares Wettrüsten in Europa! Hier scheinen zu viele schon vergessen haben, daß es in der Kuba-Krise 1962 und zweimal 1983 beinahe zum Atomkrieg gekommen wäre. Einmal nur wegen Missdeutung einer Nato-Übung und das andere mal, weil ein technischer Fehler den Russen meldete, daß amerikanische Interkontinentalraketen im Anflug seien. Das Iran-Nuklearabkommen war für die USA nie rechtlich bindend. Dazu hätte es die Zustimmung des Kongresses gebraucht. Obama hat dieses Abkommen aber nie dem Kongreß zur Abstimmung vorgelegt, und er wußte auch sehr genau, warum nicht. Es ist damit nur eine reine Absichtserklärung, kein internationaler Vertrag. Da die westeuropäischen Atommächte aus vielen Gründen nicht ihre Atomwaffen im Gegenzug zu einem europäisch-russischen INF-Vertrag abgeben werden, gibt es nur eine reale europäische Option, eine gefühlte oder reale militärische Bedrohung durch Rußland zu beseitigen: CFE-II ratifizieren, in Abstimmung mit Rußland. Rußland hatte CFE-II schon einmal ratifiziert, die NATO noch nie. Eine westliche CFE-II Ratifizierung wäre ein deutliches politisches Signal, dem sich Rußland nach den bisherigen Erfahrungen in Bereich auf Rüstungsreduktion und Rüstungskontrolle wohl nicht verweigern würde. Sie haben leider Recht. Die USA wollen aber den Vertrag auflösen. Das hat Pompejo ja mehr als deutlich gesagt. Die 60-Tagefrist sind ja nur ein Feigenblatt. Europa ist der große Verlierer in diesem strategischen „Spiel“. 1962 und 1983 mit 2018 zu vergleichen. Geht’s noch? Nennt mal bitte ein europäisches Land, welches jetzt der Stationierung von Nuklear-Mittelstreckenraketen auf seinem Territorium zustimmen würde. Nicht einmal die Polen würden dem zustimmen oder zumindest würde die Bevölkerung da ganz schnell auf den Straßen demonstrieren. Und der Bürgerwille zeigt sich auch mal ganz schnell an der Wahlurne. Ist nicht toll, wenn solche Verträge gekündigt werden weil natürlich die Gefahr dadurch größer wird. Da bin ich ja bei euch. Aber den Teufel jetzt an die Wand malen muss man auch nicht. Wer kann mir erklären, wo im Pazifik, mit Aussnahme von Guam, die USA gerne und sinnvoll INF relevante Marschflugkörper an Land stationieren möchten und könnten? Japan ist daran nicht interessiert, Südkorea auch nicht, die Philippinen, Vietnam und Taiwan sind völlig aussen vor. Damit wären wir zurück im europäischen Raum bzw. dem mittleren Osten. Saudi Arabien hingegen wirft bei mir deutlich Fragen auf. Russland profitiert ganz eindeutig an erster Stelle am Ende des INF Vertrages, zumindest solange wie die anderen Nachbarn Russland sich nicht einem vergleichbaren Vertragswerk anschliessen. Somit rücken konkret die beiden AEGIS Ashore Installation in Rumänien (existent) und Polen (geplant) in den Fokus. Der dritte Nutzer, Japan, wird zumindest zum politischen Fragezeichen für seine Nachbarn China und Russland, wenn wenn aus einem Hubschrauberträger ein Flugzeugträger wird, dann kann sich theoretisch auch die Beladung eines Mk41 schnell wandeln – es muss ja nicht gleich ein nuklear bestückter Thomahwak sein. „…Der JCPOA ist für sich genommen zwar kein völkerrechtlicher Vertrag i.S.v. Art. 2 der Wiener Vertragsrechtskonvention (WVRK), wohl aber eine – rechtsverbindlich gewordene – Vereinbarung zwischen Staaten. Insoweit ließen sich die allgemeinen völkerrechtlichen Regeln über die Beendigung von Verträgen29 – zumindest analog – anwenden. Sie betreiben mal wieder Geschichtsklitterung. Nachdem der SALT II -Vertrag 1975 von US-Seite nicht ratifiziert wurde, begann RUS bereits in 1976 mit der Stationierung von Mittelstreckenraketen des Typs RSD-10 (hier bekannt als SS-20) im europäischen Teil des Landes. Der NATO-Doppelbeschluss von 1979 war die Reaktion des Westens auf die russische Aufrüstung. Nach der Entscheidung des Deutschen Bundestags im November 1983 hat RUS sämtliche Verhandlungen über nukleare Abrüstungsverträge (START, MBFR und INF) für unbestimmte Zeit auf Eis gelegt und die Stationierung weiterer Mittelstreckenraketen in der damaligen DDR und Tschechoslowakei angekündigt. Die darauf folgende Stationierung von US-Mittelstreckenraketen in Europa führte 1987 zum INF-Vertrag. Gorbatschow hatte Reagan die Verhandlungen nicht aus Nächstenliebe angeboten, sondern weil die desaströse wirtschaftliche Lage des Sowjetunion ein weiteres Wettrüsten nicht hergab. Wir sollten bei dieser Diskussion unbedingt beim tatsächlichen geschichtlichen Ablauf bleiben. Natürlich ist das vergleichbar. Man muss halt die Unterschiede und die Gemeinsamkeiten benennen. Vieles ist anders, aber einiges auch ähnlich. Ich bin mir nicht sicher, dass in Europa alle Leute unisono gegen eine Stationierung von Mittelstreckenraketen sein müssen. Natürlich sind immer alle froh, wenn derartige System abgezogen oder außer Dienst gestellt werden, wie könnte dem anders sein, aber eine neue strategische Notwendigkeit für eine Stationierung kann sich gleichwohl ergeben. Mir sind jedenfalls amerikanische oder meinetwegen auch französische Raketen immer noch lieber, als das gruselige Gespenst eigener deutscher Nuklearwaffen, das 2017 durch die Presse geisterte. Die seinerzeit vor dem NATO-Doppelbeschluss von der Sowjetunion vorgetragenen Bedenken und Horrorszenarien waren nahezu exakt die gleichen wie wir sie heute wieder lesen können. Eine Zustimmung zur Stationierung der Pershing II würde die Grundlage für Abrüstungsverhandlungen zerstören, weil Eskalation drohe, yadda, yadda, yadda. Wie wir wissen, war allein die glaubhafte Abschreckung unter kontinuierlicher Gesprächsbereitschaft die Grundlage für den späteren INF-Vertrag, mit dem die nukleare Gefahr letzten Endes dann nach zähen Verhandlungen gebannt wurde. Da Russland sich augenscheinlich an den Vertrag ohnehin nicht mehr gebunden fühlt, ist es bei aller Ranküne gegen Trump nur konsequent, wenn die USA vor einer Entscheidung zur Aufrüstung in Reaktion auf die neuen russischen Systeme den zur Makulatur gewordenen Vertrag aufkündigen. Sofern ein Wettrüsten weiterhin von diplomatischen Bemühungen zur Abrüstung begleitet wird, sehe ich die Chancen für einen neuen Abrüstungsvertrag in einigen Jahren gar nicht so schlecht. Spätestens nach einem Ende der Ära Putin wird sich zeigen müssen, wie robust das Machtsystem im Kreml sich am Ende erweist. Die USA haben die „internationale Weltordnung“ nicht gekündigt. Auch Präs. Trump nicht, sondern die RF, die offen dagegen verstößt, wie die NATO auch festgestellt hat. Den russ. Verstoß hat schon Obama angesprochen. Was ist passiert? Die RF machte weiter! Und nun? Weiter so, Hauptsache die papierene „Weltordnung“ besteht weiter? Die USA mögen vielleicht sogar selber Spielräume nutzen und Grenzen überschreiten. Aber dann tun sie es geschickter UND sicher nicht erst seit Anfang 2017. Die Weltordnung ist beweglicher – multipolarer – geworden, gewöhnen wir uns daran. Verträge schließt man mit Vertragspartnern ab. PARTNER. Nicht mit Vertragsgegnern. Und zur Partnerschaft gehört etwas mehr als ein apriori: der da ist schuld! Man muss sich auch damit abfinden, dass die eigene Position nicht zwingend der reinen Wahrheit entspricht, wiewohl unserer Auffassung nach gut begründet. Andere, abweichende Positionen können genauso gut begründet sein. In Bezug auf einen Nuklearkrieg sitzen wir alle in einem Boot und die Idee der Partnerschaft ist eigentlich gar nicht so abwegig. Wenn man denn will. Sie melden doch nicht etwa Zweifel an, dass die Aussagen von USA/Nato hier möglicherweise nicht ganz der Wahrheit entsprechen? Nun ja, wie man an der russischen Grenze iranische ICBM abfangen möchte, erschließt sich mir auch nicht. Das gelingt, wenn überhaupt, nur in der Startphase, aus eher geringer Entfernung. Kann mir jemand beantworten warum die SS-C-8 mit einer Reichweite von < 500km (meines Wissens nach bis 480km) gegen den INF Vertrag verstoßen soll? Die Bemühungen des Außenministers genau die dahinter liegenden Technologien einem Rüstungskontrollregime zu unterwerfen sind davon schon sehr weit weg. Angeblich, so die US-Berichte, soll die SS-C-8 die gleichen Fähigkeiten haben wie die seegestützten Kalibr Cruise Missiles. Und die haben eine Reichweite von mehr als 2.500 km. Das wäre ein eindeutiger Vertragsverstoß. Sie meinen wahrscheinlich die Iskander Raketen (SS-26 Stone), die tatsächlich eine Reichweite von knapp unter 500 km haben. Die USA arbeiten weiter an einer Interessenpolitik gegen Europa und Bestrebungen der kosovarischen Regierung welche die Security Force in eine reguläre Armeeumwandeln will. Abstimmung im Parlament 14. Dezember. Lieber Pio natürlich haben Sie recht, das die SS 20 eher als die Pershing stationiert worden sind. Nur, ich habe die ganze Zeit von Marschflugkörpern geschrieben. Die SS 20 sind ballistische Flugkörper. Diese wurden, ich glaube ab 1983 in Europa stationiert (Tomahawk, Reichweite sehr variabel bis 2500 km) und ich kann mich noch gut erinnern das Einige extrem begeistert waren das man jetzt was habe was einen schönen abgestuften Nuklearkrieg (die Auswirkungen auf Zivilbevölkerung und Umwelt wurden ausgeblendet) ermöglicht von lokal begrenzt bis zum Enthauptungsschlag. Dieselben waren dann sehr unerfreut als bekannt wurde das die Russen dasselbe hatten. Da wurde dann rumschwadroniert, das die eh nichts taugen (wegen der Schwäche der Russen bei Elektronik) usw. Vollkommen ausgeklammert waren da so Aspekte wie das die Treffergenauigkeit bei 250 kT keine so große Rolle spielt. Andere die sich wohl etwas ernsthafter damit beschäftigt hatten sahen sehr wohl das Gefahrenpotenzial, also die Vorteile (schlechte Erfassbarkeit, konventionell und nuklear bestückbar, vor allem kaum Vorwarnzeit) als man dachte das man da ein Alleinstellungsmerkmal hatte. Das Ende vom Lied war, das die meisten eine scheiß Angst hatten das eventuell eine aus versehen abgeschossene Lenkwaffe (weil der Gegner nicht erkennen kann ob die nun eine Atomwaffe an Bord hat, bei einer ICM oder einer SS 20 ist klar woran man ist) den dritten Weltkrieg auslöst. Nach dem was mir bekannt ist war das mit ausschlaggebend das man sich dann doch für eine Rüstungsbegrenzung entschieden hat. Das sind so meine Erfahrungen aus der Zeit. Ich weiß jetzt nicht ob das repräsentativ war, ich hatte zweimal bei einer Reserveübung, das der plötzliche überraschende Nuklearschlag als Alarmübung ohne Vorwarnung (auch wir Offiziere hatten keine Ahnung) angesetzt wurde. Alles sehr realistisch, einigen sind die Nerven durchgegangen. Es wird dir einfach anders, weil zu dem Zeitpunkt war sowas ohne weiteres denkbar und unabhängige Informationen hast du in dem Moment nicht. Es ist eine Sache ob man sich bewusst freiwillig in einen Konflikt begibt um sein Land zu verteidigen oder ob man befürchten muss, das man gerade miterlebt und eventuell mitwirkt wie die Menschheit kollektiv Selbstmord begeht. Eventuell wäre es auch sinnvoll gewesen zu erwähnen das die Russen praktisch aus einer Trotzreaktion oder um Druck zu machen oder aus Angst oder einfach aus der Logik des this for that heraus die SS 20 stationiert haben als der 1976 von Kissinger und Gromyko Vertrag zur Begrenzung von Mittelstreckenraketen vom damaligen US Präsidenten (Name vergessen) abgelehnt wurde. Aus meiner Sicht ein ähnlich bescheuertes Verhalten (der Russen) wie jetzt die Installation einer Raketenabwehr in Osteuropa welche sich angeblich gegen Nordkorea und den Iran richtet. Dieses Abwehrsystem wiederum nehmen die Russen zum Anlass um ihren (durchaus möglichen;) Vertragsbruch (das die die technischen Grundlagen haben und sowas entwickeln kann man als gesichert annahmen) zu begründen. Vermutlich auch nur um sich vor den Nordkoreanern zu schützen (Ironie). Ich sehe einfach das das aktuelle Gepolter (da sehe ich beide Seiten in der Pflicht) uns schnell wieder zu einer Situation wie 1976 bringen kann. Uns sollte es dann mal knallen, ist es letztendlich egal wer angefangen hat und wer welchen Vertrag nicht eingehalten hat. Wir brauchen keine neuen Schuldzuweisungen sondern vertrauensbildende Maßnahmen. Die müssen von beiden Seiten kommen und das kann, wird und muss auch Aspekte umfassen die uns eventuell nicht so schmecken werden. Letztendlich sind die Russen von heute kein Roten mehr sondern ein Haufen (meist krimineller) Kapitalisten welche ihren Staat unter sich aufgeteilt haben (Jelzin und Putin haben da ganze Arbeit geleistet) und lieber selber Land und Leute ausbeuten. Die wollen und brauchen dazu keine Hilfe von außen. Die sind keine Ideologen welche sich für die Sache opfern aber sobald die sich in die Enge getrieben fühlen werden die mit Sicherheit extrem bissig. Die ganzen Farbenrevolutionen haben die (zurecht) als persönliche Bedrohung empfunden und darauf mit Entschlossenheit und Härte reagiert. Das habe ich mir jetzt nicht aus den Fingern gezogen, das sagen die Leute vor Ort so. Ich vermute, sobald man dieser Clique Überlebensgarantien gibt wird sich die Situation sehr schnell erheblich verbessern. Dann werden die auch wieder zu Zugeständnissen bereit sein. Reicht vermutlich schon das die ihr geraubtes Geld weiter in GB und bei uns bunkern können. Langfristig (sehr langfristig) kann es sein das die Zivilgesellschaft dort dann auch gestärkt wird. Und letztendlich, weder die ukrainische, noch die russische und nicht zu vergessen auch unsere Bevölkerung hat es verdient in einen sinnlosen Konflikt gestürzt zu werden der nur Verlierer hinterlassen würde. Nicht nachvollziehbar ist das sich unser Bundesaußenminister Heiko Maas wie ein Schuljunge in die erste Reihe neben den Außenminister Mike Pompeo stellt und die Interessen der USA teilt, wie den Ausstieg aus den INF Vertrag. Sein Job ist eigentlich dafür zu sorgen das endlich die Fakten auf dem Tisch kommen und das mit Nachdruck an eine Lösung zum Einhaltung des INF Vertrages kommt. Leider keine Details zu den beiden Flugkörpern die angeblich den INF Vertrag brechen. Dein gesetzter linkt verweist auf Flugkörper die von Wasserfahrzeuge oder Luftfahrzeuge abgefeuert werden, dadurch nicht gegen den INF Vertrag verstoßen. Ferner passen diese Flugkörper nicht in die Iskander Startfahrzeuge. Die USA behaupten dass dieses Iskander Systeme, dass auch in Exklave Kaliningrad stationiert ist gegen den INF Vertrag verstößt. Die Rakete rechts und in den Container links in Bild soll ein Marschflugkörper stecken der über 2000 Kilometer fliegt. Daniel Coats, Chef der nationalen US-Nachrichtendienste behauptet das „Novator“ den Auftrag erhalten hat eine Rakete zu bauen, die sehr ähnlich zu anderen sein soll, die zu dem Zeitpunkt entwickelt wurden, aber deutlich weiter fliegen soll. Als Laie in Raketen Technik behaupte ich, das die Rakete nach dem was heute technisch machbar ist, niemals rund 2000 Kilometer weit fliegt. Wenn ja, könnte eine Ariane Trägerrakete mit dieser Technologie demnächst die vierfache Nutzlast in Weltraum wuchten. Tatsächlich haben die Russen eine Iskander ( 9M729 ) Rakete in ihren Waffenarsenal, die weiter als die erlaubten 499 km fliegt. Es handelt sich um die luftgestützte Hyperschallrakete Ch-47M2 „Kinzhal“, die aber INF Vertragskonform ist. Um den neuen Marschflugkörper wir es sich vermutlich um die Kh-101 handeln. Doch nicht so unbekannt, geheimnisvoll? 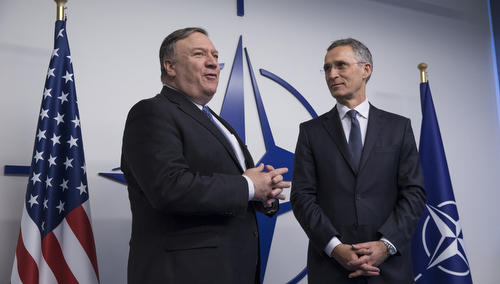 NATO and the United States have increased their pressure on Russia over its alleged violation of the INF treaty. Nicht nur die tatsächliche Reichweite, zu der es keine verlässliche Aussage gibt, und die Vertragverletzung bedeutet, stellt das Problem dar . Die neuen Flugkörpersysteme sind kompakt, mobil und schwer im Einsatz zu detektieren, in Stellung aufzuklären. Werter Knuffel, danke für die Antwort. Leider vergleichen Sie hier Äpfel mit Birnen. das westliche Gegenstück zur SS-20 war die Pershing II. Das russische Gegenstück zum Marschflugkörper Tomahawk war aus der Kalibr-Familie der Marschflugkörper Klub-T/M. Stationiert auf LKw MZKT-7930 oder BAZ-6909. Dann stimmt die Zuordnung. Natürlich haben Sie recht, was die Erfassung von solchen Flugkörpern angeht, auch damit, dass die Bedrohung dann immanent wäre und die Gefahr eines nuklearen Krieges steigt. Das will ich auch nicht, wohl keiner. da sind wir uns einig. Ihre Ausführungen zur russischen Regierung möchte ich nicht kommentieren. Nur, was wollen Sie mit einem Abrüstungsvertrag, der offensichtlich schon gebrochen wurde, noch anfangen. Die Kommunikation ist spätestens seit 2014 massiv gestört. Anscheinend braucht es mal wieder etwas Fingerhakeln, damit man zueinander findet. Ich hoffe, das funktioniert. Dreht Russland an der INF-Treaty Raketenschraube? Offenbar langfristige Planung, wohl wissend, wie die USA reagieren würden. Der U.S.-Ausstieg wird (ist?) für Putin willkommener Anlass bei INF-Rüstung in die ollen zu gehen. WSJ berichtet von inzwischen drei (!) Stationierungsorten der neuen SSC-8 Raketen, einer davon im westl. Russland, insgesamt aber noch unter 100 Raketen. Solange Washington keine wirklichen Beweise vorlegt, sind die russischen Mittelstreckenraketen allesamt irakische Chemiewaffen. Natürlich kann ein Land unbeschadet eines Vertrages, der nur landgestützte Raketen verbietet, Flugkörper und Raketen entwickeln, die see- oder luftgestützt abgeschossen werden. Doof wird das allerdings, wenn solche Systeme dann so modifiziert werden, dass sie von landgestützten Systemen abgefeuert werden können und somit zu landgestützten Raketensystemen werden. Einen luftgestützten (nuklearfähigen) Marschflugkörper mit luftatmendem Triebwerk kann ich ggf. auch so umkonstruieren, dass er von einem Launcher an Land mittels einer Raketenstufe gestartet werden und dann regulär weiterfliegen kann. Seegestützte sowieso. Dabei sind auch erheblich höhere Reichweiten als bei den ursprünglichen Systemen durchaus drin. Kommentare wie: „Als Laie in Raketen Technik behaupte ich, das die Rakete nach dem was heute technisch machbar ist, niemals rund 2000 Kilometer weit fliegt.“ sind in Diskussionen bestenfalls putzig. Schon mit Basisschulwissen in Physik und minimaler Recherche kann man nachvollziehen, warum solchen Aussagen inhaltlich quasi keinerlei Bedeutung beizumessen ist. Rechtlich ist sicherlich bedeutsam, was die jeweiligen Verträge genau untersagen. Eine Flucht in Rabulistik ist allerdings auch nicht wirklich ein Beitrag für den Weltfrieden.